The recent revival of vintage baseball cards with subjects like Babe Ruth, Ty Cobb and Walter Johnson has precipitated the resurgence of W-Series Strip Cards. These nearly 100 year-old cards fill a need from an era where few sets were produced while also providing a great alternative to the more recognized mainstream brands. Originally given to with purchases or sold to customers, these cards are presented as "fronts only" since the backs are blank. 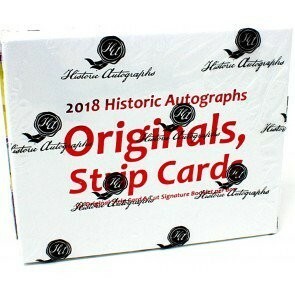 Our 2018 HA Originals, Strip Cards features a historic line-up of players paired with vintage cut autographs presented in 4"x4" booklet to protect the fragile cards & autos while beautifully displaying true baseball history. Also included are (6) big non-baseball names that also appeared in the different strip card series - Boxers: Jack Dempsey, Max Schmelling, Jack Sharkey and Gene Tunney; Golfer Gene Sarazan and Swimmer Johnny Weissmuller. This product is loaded with vintage Hall of Famers - and stacked with HIGH ENDS names. This means that there is guaranteed Group A OR Group B player in EVERY CASE plus AT LEAST (2) other Hall of Famers in every case - average is over (4) HOFers in every case. Non-HOF players include Wally Pipp, Arthur Fletcher, Adolpho Luque and other signature rarities.